I wrote earlier of three clocks. Here is the clock with no hands. I did some research and found none like this anywhere. Any information would be appreciated. As with the others, I want to insure or sell this clock. Thank you all. Thank you for the information. The trade mark on the porcelein face is Ansonia. The works inside are also stamped with the Ansonia trade mark. 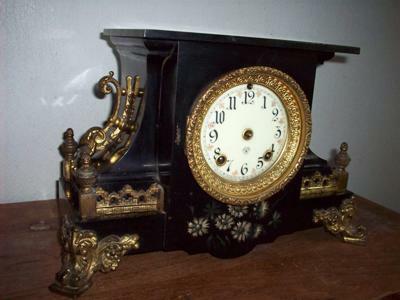 I have found two clocks very similar to mine on line but, they all have different side moldings and they were French made with Ansonia works. I'm still trying to find a clock identical to mine so I can be sure of what I have. I appreciate your input and will welcome any information. Your clock looks very much like an Ansonia. It has the typical Ansonia bezel and, although a bit hard to see, it looks like the Ansonia trade mark just below the center shaft. It may also have a Brocot type suspension often used by Ansonia.